Charters produce more, with less money. In fact, charter schools receive 30 percent less per student than what a typical public school receives, yet they perform better -- for every $1,000 in funds, charter school students perform better on standardized testing -- 16 points higher on reading, and 17 points higher on math. Charter schools have more racial diversity than traditional public schools. Whites make up 52.4 percent of traditional public school students but just 35.6 percent of charter school students. Minority children from low-income families see real academic gains from charter schools. For example, blacks from low-income families attending charter schools receive the equivalent of an additional 7.5 weeks of math instruction and 6.5 weeks of reading instruction. The Reason report notes that 91 percent of students in New Orleans attend charter schools today. Remarkably, as economist Jared Meyer of Economics21 noted in The Hill, the high school graduation rate in New Orleans has risen from just 54 percent in 2004 to 78 percent today. Source: Jason Keisling, Nick Gillespie and Lisa Snell, "5 Facts About Charter Schools," Reason.com, January 28, 2015. Groups across the country are calling for raising the minimum wage, but Diana Furchtgott-Roth, director of Economics21 at the Manhattan Institute, says they should be focused on another issue: school choice. Researchers from Harvard University and Columbia University determined that replacing a poor teacher with a merely average teacher would boost a student's lifetime earnings by $14,500. A study from the Brookings Institution and Harvard University found that private school vouchers boosted college enrollment for black students by 24 percent. Allowing students to attend the schools that work best for them is a better way to improve economic mobility than mandating that employers pay minimum wages. Rather than help low-income workers, minimum wage increases reduce employment and job prospects, especially for teenagers. Source: Diana Furchtgott-Roth, "Minimum Wage Advocates Should Support School Choice," Economics21, January 27, 2015. There are some people who insist on advocating solely for private schools; the immediate and complete abandonment of state funding for education (and health and welfare). These advocates have a role to play. I differ. There are these word puzzles that go something like, 'change the word class to growl in 5 steps' changing one letter at each step to form a new word (a do-able example if you want to have a crack). I view societal change in the same manner. Charter schools or vouchers may only be the first or second step but the third won't be reached until those earlier steps are. And change is dynamic. So by the time the 'final' step is reached, a whole new impetus is working for even further change. Especially when technology is transforming the learning environment so rapidly. 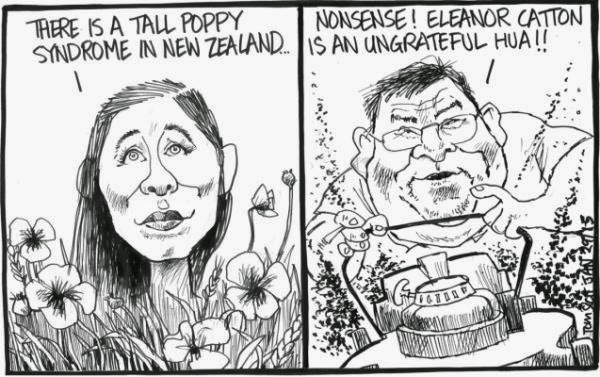 Tom Scott's DomPost cartoon this morning was predictable. Eleanor Catton was NOT a victim of the 'tall poppy syndrome' - the existence of which is questionable nowadays - but she will certainly now experience an unpleasant but justifiable backlash, which she will claim proves her point. Being generous, I think her comments demonstrate naivety as much as anything else. "This morning the new Labour Leader gave his first state of the nation speech – a chance to see the new direction, if any, that Labour is taking. As they say, talk is cheap, and this speech was bargain basement. Fully embracing minimalism, the speech didn’t just skimp on details; it tried to make a virtue of it. It was chock full of “finding ways to”, “ensuring that”, “getting serious about”, “harnessing the power of”, “developing a programme of”, “will make sure that”, and so forth." ...I couldn't. None of the required qualifications. More to the point, I wouldn't be interested. The daily fee is $565 - plus expenses - with an expected 10 meetings yearly. Why with "particular reference to Maori"? Are they intimating that Maori families are more in need of intervention than others, or is it some sort of 'honouring the Treaty' convention?